This Is Not A Film (Palisades Tartan) — For those unfamiliar with the backstory: Jafar Panahi, one of Iran’s most acclaimed directors (The White Balloon, The Circle, Crimson Gold, Offside), was arrested in 2009. 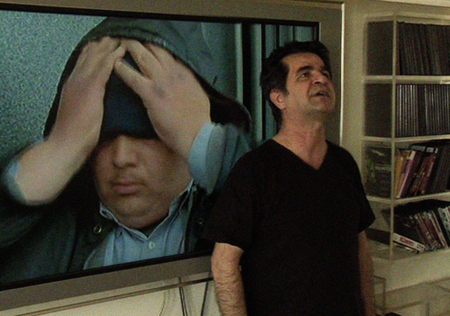 A known supporter of the opposition movement, Panahi was charged with “activity against national security and propaganda activities against the regime.” Despite domestic and international outpourings of support, he was sentenced in 2010 to a six-year prison sentence and a 20-year ban on directing movies, writing screenplays, speaking to the press, or leaving the country—an exceedingly harsh sentence, but one reflective of the Iranian government’s post-2009 crackdown on free expression. Panahi continues to appeal his sentence, but faces the possibility that he may have to return to prison at any time. This Is Not A Film, co-directed by Panahi and documentary filmmaker Mojtaba Mirtahmasb, was shot while Panahi was under house arrest and awaiting the results of his first appeal. Read Nelson Kim’s full HTN review. Available on DVD . Smashed (Sony Classics) — I was initially drawn to James Ponsoldt’s Smashed by its cast. Mary Elizabeth Winstead, Nick Offerman, Megan Mullally, Octavia Spencer, Aaron Paul: this is substantial talent with an impressive range (though in truth I’d watch Aaron Paul read the phone book). As Katie Hannah, an alcoholic trying to get sober, Winstead gives the anchoring performance, but Ponsoldt’s film really is an ensemble piece, deftly making the most of even the smaller characters and scenes. There’s a giddy, anticipatory enjoyment in seeing top-tier television actors take on film roles, a pleasure the director seems to share with his audience. Working off the restrained, elegant screenplay by Ponsoldt and Susan Burke, the cast said they felt little need to improvise. I attribute this to Ponsoldt’s balanced direction, and his almost musical instincts for the tonal shifts of a scene. Addiction is inherently dramatic, and stories centered on it can easily devolve into miserablism or hot mess histrionics. Smashed pulls back from that drama in favor of a milder, much more realistic tone. It’s also very funny without being Apatow-ish. This shines through in Winstead’s immersive performance as Katie, a young woman stumbling, painfully, toward responsibility. It’s her honesty that wins our sympathies, and distinguishes Smashed from more conventional stories of addiction. Read Susanna Locascio’s full HTN review. Available on DVD , Blu-ray , and at Amazon Instant . Kumare (Kino Lorber) — (The following capsule is taken from Mike S. Ryan’s 2011 SXSW Wrap-Up.) The doc film that just about demolished all of its competition was Kumare. It was one of those films that everyone was talking about and that managed to draw in non-film interactive types. “Kumare” is actually Vikram Gandhi, a New Jersey born Indian who went to Columbia University and decided he would debunk the whole religion racket by growing his hair and beard and becoming a true shyster guru himself. He learns yoga and walks into Phoenix Arizona with flowing robes, barefoot with a shepherd’s staff. He speaks in a bad fake Indian accent and at times sounds more like Borat than your recently arrived cab driver, “You put coka in arm, how do that? Big needle?” He creates his own yoga positions, which are inspired by Pete Townsend guitar moves and he creates chants and a theory about the inner blue light. The endeavor does go beyond a Borat adventure because Kumare does actually feel empathy for his followers’ genuine search for meaning. By the time we get to the part of the story where the shyster gets punk’d by his own scam, we have been fully taken in by the victims and are starting to identify more with them than Kumare’s cynical easy skepticism. Because Kumare is also a good actor, we then feel his pain as he decides that he must reveal his true self to them. It’s a compelling story that also, as one audience member mentioned in the Q&A, proves both sides of the argument regarding the truth vs. fiction debate about religion and faith. It’s a film that deserves all of the attention it will most likely receive (it won the Audience Award for Documentary Feature). Available on DVD and at Amazon Instant . Killing Them Softly (Starz/Anchor Bay) — Available on DVD , Blu-ray , and at Amazon Instant . Dark Feed (Lionsgate) — Available on DVD and at Amazon Instant . 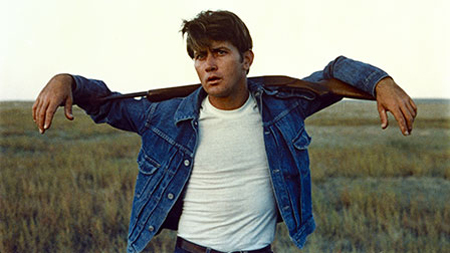 Badlands (Criterion) — Available on DVD and Blu-ray . The Life and Death of Colonel Blimp (Criterion) — Available on DVD and Blu-ray . The Blob (Criterion) — Available on DVD and Blu-ray . Ministry of Fear (Criterion) — Available on DVD and Blu-ray . Porky’s (20th Century Fox) — Available on Blu-ray . Rust and Bone (Sony Classics) — Available on DVD , Blu-ray , and at Amazon Instant . Zero Dark Thirty (Sony) — Available on DVD + UltraViolet Digital Copy , Blu-ray/DVD Combo + UltraViolet Digital Copy , and at Amazon Instant . Life of Pi (20th Century Fox) — Available on DVD , Blu-ray , Blu-ray 3D , and at Amazon Instant . This Must Be The Place (Starz/Anchor Bay) — Available on DVD , Blu-ray , and at Amazon Instant . Love For Levon (Time Life) — Available on 2xDVD , 2xBlu-Ray , 2xDVD + 2xCD , and 2xBlu-Ray + 2xCD . Sound City (RCA) — Available on DVD , Blu-Ray , and at Amazon Instant . Hitchcock (20th Century Fox) — Available on Blu-ray/DVD Combo and at Amazon Instant . Price Check (MPI Home Video) — Available on DVD and at Amazon Instant . The Big Picture (MPI Home Video) — (Romain Duris and Catherine Deneuve, that is, not Kevin Bacon.) Available on DVD and Blu-ray . Bachelorette (Starz/Anchor Bay) — Available on DVD , Blu-ray , and at Amazon Instant . The Girl (HBO) — Available on DVD . Sholem Aleichem: Laughing in the Darkness (Docurama) — Available on DVD and at Amazon Instant . Connected (Docurama) — Available on DVD . Finally caught up with Panahi’s vital THIS IS NOT A FILM, and I love me some KUMARE, but there’s two more that came out on DVD today that are worth taking a peek: Artsploitation Films’ HEMEL (an evocative character study about a promiscuous Dutch girl) and Cohen Media Group’s THE OTHER SON (a humanistic Israeli/Palestinian switched-at-birth drama).